The famous S.C.B. Medical College and Hospital, Cuttack is now equipped with NAT screening facility at its attached Blood Bank, which would ensure purest possible blood to its innumerable patients needing blood transfusion to save their lives. 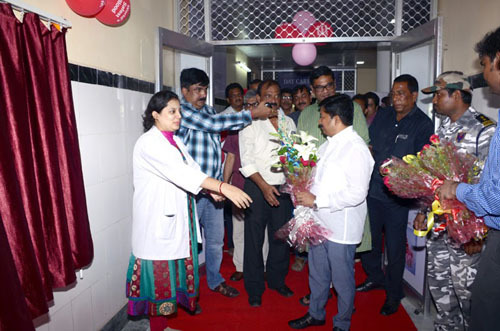 The facility was launched on 10th June as per program by the State’s Minister of Health and Family Welfare Mr. Atanu Sabyasachi Nayak, who also holds the Information and Public Relations portfolio. Chief of the Blood Bank Dr. Pankaj Parida, and top brass of the Medical College were present on the occasion and welcomed the launching. The event was graced by MLA Debasish Samantaray. It is Cuttack, where the High Court of Orissa had, in a landmark judgment on 28th July, 2011, issued a mandamus for installation of NAT facility in every Blood Bank to ensure pure blood to patients, as the outdated systems in vogue were evidently incapable of detecting all the pernicious viruses like HIV in their window period, as a result of which innocent patients were getting afflicted with AIDS. The mandarins of Health department having slept over the mandamus, this site had exposed the matter on 8th July 2012 and continued to harp on it, provoking the then Opposition Chief Whip Prasad Harichandan to raise the issue through an adjournment motion in Orissa Legislative Assembly. It was taken up on 1st September 2012 and the Minister of Health Dr Damodar Raut, as he then was, in answering the adjournment motion, had assured the House to provide the facility in phased manner, with the three Government Medical Colleges and the Capital Hospital getting it in the first phase. But it took long four years to materialize. The facility is established in PPP mode with the State Government partnering with Roche Diagnostics India, considered the country’s in-vitro diagnostics market leader. However, though the delay in commissioning the NAT technology is regrettable, the most pleasing and noteworthy part of the project is that, on suggestions of the Health Minister Mr. Nayak, Chief Minister Mr. Naveen Patnaik has bestowed upon the patients the facility to have NAT tested pure blood absolutely free of cost. Hence it is viewed as beginning of a new era of responsible healthcare in Orissa.